On the 20th of September, join Eden Cinemas at the launch of their exclusive LIVE Cinema culture season. Doors will open at 7.45pm to celebrate the season launch with a pre production reception featuring drinks and freshly prepared nibbles. 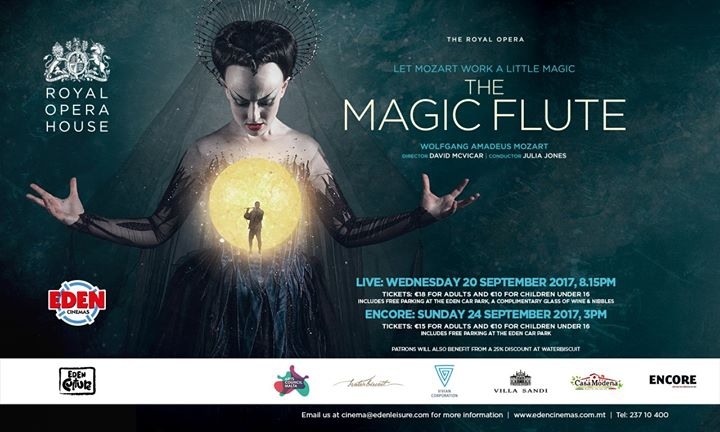 The cultural slate will then commence with the Royal Opera’s spellbinding production of Mozart’s The Magic Flute, which will be broadcast live from the Royal Opera House directly to the big screen at 8.15pm. Mozart’s glorious opera The Magic Flute is brought enchantingly to life in David McVicar’s production with beautiful sets by John Macfarlane. Prince Tamino promises the Queen of the Night that he will rescue her daughter Pamina from the enchanter Sarastro. He begins his quest, accompanied by the bird-catcher Papageno – but all is not as it seems. David McVicar’s classic production embraces both the seriousness and comedy of Mozart’s work. The audience is transported to a fantastical world of dancing animals, flying machines and dazzlingly starry skies. The setting provides a wonderful backdrop for Mozart’s kaleidoscopic score, from the Queen of the Night’s coloratura fireworks to Tamino and Pamina’s lyrical love duets and Papageno’s hearty, folksong-like arias. Eden Cinemas aims to create the feel of a theatre environment, whilst giving the audience a chance to experience Mozart’s The Magic Flute at a fraction of the overseas prices. Tickets are available at €18 for adults and €10 for children under 16. This includes the pre production wine and nibbles, complimentary parking at the Eden Leisure Car park and 25% discount at Waterbiscuit. For those unable to attend the live show, an encore screening will be held on Sunday 24th September at 3pm. Tickets are priced at €15 for adults and €10 for children, including free parking and 25% discount at Waterbiscuit.